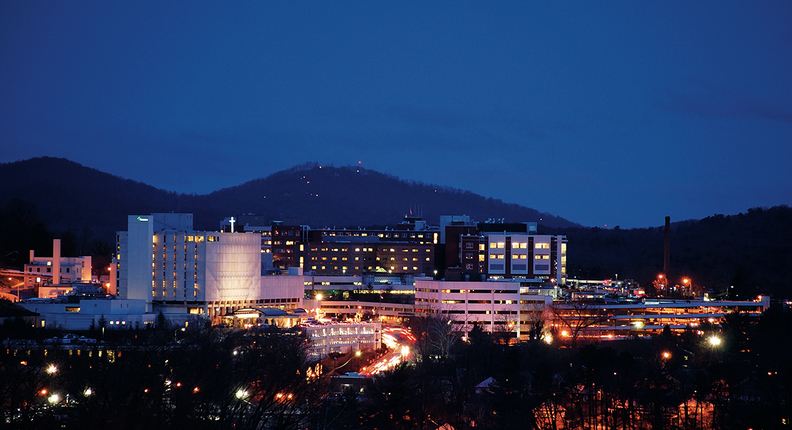 Mission Health's flagship campus in Asheville, N.C., is at the center of a hub-and-spoke system. HCA Healthcare isn't offering specifics around why the leading chain wants to acquire Mission Health, but for some it's not hard to surmise: market share. Mission, a six-hospital, not-for-profit health system based in Asheville, N.C., holds a 49.5% market share across the 11 counties it operates in, according to an analysis by consulting firm Healthcare Management Partners using the Modern Healthcare Metrics database. That's compared to a 50.5% share divided among its competitors. "They're clearly the market leader," said Scott Phillips, managing director with the Nashville-based firm. Policy and legal experts say the recent elimination of state-imposed limits on Mission's margin, costs and physician hiring may have sweetened the deal. State officials put the so-called Certificate of Public Advantage in place in 1995 to avoid a federal antitrust challenge when two competing Asheville hospitals merged to become Mission. If the deal goes through, HCA will inherit Mission's market power to raise prices, said Dr. Robert Berenson, a fellow with the Urban Institute who studied Mission's COPA for a 2015 report. "The state created a monopoly but then abandoned the regulation that governed the monopoly," he said, "and now the monopoly is free to exert its market power." That belief squares with HCA's track record of targeting hospitals and systems that dominate their respective markets. Even as inpatient volumes slump in other systems, HCA has managed to keep its numbers stable, a factor that's driven largely by the markets it chooses to operate in, said Ana Gupte, senior analyst and managing director of healthcare services with Leerink Partners. "They're No. 1 in the markets they're in, so they're in a better place to get good rates from payers, invest in service lines and take share from their competitors," she said. Mission's smaller hospitals are neatly organized within driving distance to its flagship Asheville campus, creating a self-contained "hub and spoke" model whereby Mission is solidly positioned to funnel patients to its main campus for major procedures, Phillips said. HCA declined to comment beyond a news release announcing the proposed deal, which would be the hospital chain's first foray into North Carolina, boosting its service area to 21 states. Mission would be HCA's largest acquisition of a not-for-profit health system it didn't already have a stake in since its 2003 purchase of nine-hospital Kansas City, Mo.-based Health Midwest for $1.1 billion. Mission CEO Dr. Ronald Paulus dismissed the idea that lifting the COPA restrictions—a change he said he requested the day he arrived at the system in 2010—contributed to HCA's interest. He said the margin cap and cost limits were never a concern because it wasn't close to hitting them. Mission's patient population is 75% Medicare, Medicaid and patients the system does not receive reimbursement from, so he said the system has long kept its cost per case below that of its competitors. That the system was pursuing a deal didn't surprise people, Paulus said. What did was that HCA was the acquirer. But Paulus said when he explained the advantages, people were less surprised. HCA's scale allows it to buy supplies and other necessities for less, it brings clinical capability in areas like oncology and cutting-edge technology like data aggregation and predictive analytics, he said. "Internally and a little bit of externally there's a little bit of grieving, and I'd be less than transparent if I didn't say I had a little bit of that," Paulus said. "Everybody wants to make it on their own, and you think you have a great plan and a great vision, and it feels sort of like it's so unfair that we're punished because of our demographics." Mission's COPA limited how much the system could increase its cost per case and precluded its operating margin from growing above a specific amount relative to comparable North Carolina hospitals. The COPA initially limited the proportion of physicians in certain specialties Mission could exclusively contract with in Buncombe and Madison counties to 20%. That was expanded to 30% in 2011, and a major exception was added: If Mission intended to exceed 30%, it had to notify state and federal regulators. Paulus said Mission exceeded the 30% threshold a few times while the COPA was in place and provided the necessary advance notice. He said Mission is still subject to a federal antitrust policy that says regulators generally won't challenge providers with physician concentrations up to 30% within a given specialty and market. Nearly 20 states passed legislation allowing COPAs between 1992 and 1995, including North Carolina, according to Berenson's 2015 Urban Institute report. Despite that, the report said they're still rarely used nationally. Last year, officials in Tennessee and Virginia granted a 10-year COPA to Wellmont Health System and Mountain States Health Alliance so they could combine to form Ballad Health. For his study, Berenson conducted interviews with attorneys for the hospitals and the Federal Trade Commission, which revealed that Mission's formation would likely have been an "open and shut antitrust action" if not for the COPA. The FTC generally opposes COPAs because they allow states to exempt themselves from antitrust regulations, he said. North Carolina lawmakers voted in 2015 to scrap the state's COPA regulations, including Mission's, with an original effective date of Jan. 1, 2018. A subsequent regulation amended the effective date to Sept. 30, 2016. North Carolina state Rep. Brian Turner, whose district includes Asheville, said he voted in favor of the COPA termination because other health systems had entered the western part of the state since 1995. And given the payer mix in Mission's service areas, declining reimbursement from government payers and the state's refusal to expand Medicaid, "they were really kind of left in a bit of a pickle," he said. In October 2017, Mission terminated its contract with its largest commercial insurer, Blue Cross and Blue Shield of North Carolina. Stories differ on what happened. According to Paulus, Mission requested a "modest, single-digit inflationary increase" in prices, but the Blues refused. Finally, they agreed to a contract in December. One criticism of COPAs is that they merely kick the can—or the adverse consequences of a monopoly—down the road, said Barak Richman, a law professor at Duke University. "That's arguably what's happening with Mission," he said. "As soon as the Certificate of Public Advantage ended, all of a sudden Mission started to be quite aggressive in how it was negotiating with Blue Cross." The fact that HCA doesn't already have operations in North Carolina makes the deal less concerning than if, say, Duke or UNC Health Care wanted to buy Mission, he added. Jay Hardcastle, a partner at law firm Bradley Arant Boult Cummings and chair of its healthcare practice group, said he doesn't foresee a valid federal challenge to the deal. The state's attorney general, however, will study the system's future commitments with respect to capital investments, hospital operations and community benefit programs, and may require ongoing commitments in those areas. It could become an issue if Mission is already viewed as dominant in the market and the addition of HCA's resources would make it more so, but that challenge would more likely come from the state level, Hardcastle said. North Carolina Attorney General Josh Stein will have ultimate say on the state level over whether the deal goes through. His office did not reply to a request seeking comment. Attorneys general tend to examine not-for-profit conversions to for-profit entities closely because the state has invested in the organization over the years through forgoing tax assessments, said Tim Greaney, a professor at the University of California Hastings College of the Law. "I would expect the attorney general to look pretty closely at it because it seems to be a pretty sizable one, he said. Both Stein and state Treasurer Dale Folwell publicly questioned whether the proposed merger between Atrium Health and UNC Health Care would raise prices before it fell through last month. With respect to this deal, Folwell said he's looking at how much money the state health plan spends with Mission, but conceded that he'll have little say over whether the deal goes through. North Carolina currently has 17 for-profit hospitals, about 12% of the state's 138 hospitals, according to the North Carolina Healthcare Association. The largest for-profit presence in the state is Duke LifePoint, whose nine hospitals are smaller and more spread out, NCHA spokeswoman Julie Henry wrote in an email. Several of Duke LifePoint's hospitals aren't far from Mission's hospitals. Community Health Systems and Select Medical each operate two hospitals in North Carolina to the east of Mission's facilities. The Tax Cuts and Jobs Act may have contributed to the tailwind that allowed HCA to pursue this deal. Not only does HCA expect to generate $500 million in cash tax savings this year, it can fully deduct property, plant and equipment in the year it's purchased, which Moody's Investors Service said could make M&A marginally more attractive.